Gold has been discovered thousands of years ago, and has since been one of rust-resistant, corrosion-resistant, and non-tarnishable precious metals associated with love and honor. 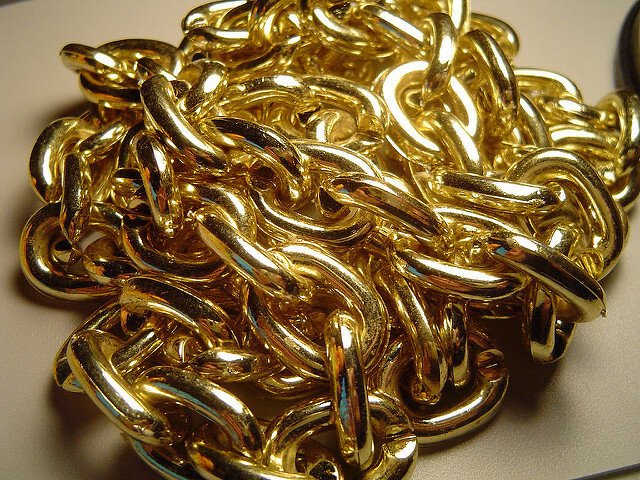 Many products such as ornaments and jewelries are derived from gold and they differ with the purity of gold. Karat was then introduced to measure the purity and fineness of gold. The most common ones are 24K and 22K followed by 18K and other lower karats. This article highlights the main difference between 22K and 24K gold. What is a 24K gold? The 24K refers to the purest gold in natural form characterized by a bright yellow color. What this means is that there are 24 parts in the gold without any impurities of other metals. The 24K has about 99.9 percent of gold. That said, there is no any gold that can be rated over 24K, i.e. 26k. 24K cold is more expensive than 22K. It is, however, not as durable as the 22K. Instead, it is pliable and less dense than the 22K, and as thus it is seldom used in jewelry and ornament manufacturing. But there are several coins made of the pure gold 24K. Medical devices and electronic devices are some of the applications of the pure gold 24K. For children suffering from ear infections, a gold-manufactured medical device called the gold tympanostomy tube is put in their ears to enhance middle ear aeration. A pure gold is a lucrative investment due to its enormous value that has a potential of appreciating. It never loses value or tarnishes. Gold invested for generation will remain in good value the generation finds it, and can be easily converted into cash anytime for lucrative earnings. There is an investment-grade gold investment which serves as a source of future wealth. This is a bullion jewelry investment comprised of gold without any impurities. When the value of gold appreciates, the jewelry also increases in value. But much jewelry today is seldom made of pure gold, but a combination of gold and other metals hence such jewelries are not re-sold at their original costs. The 22K gold follows 24K with purity. Its purity is identified by 22/24*100 which gives 91.67% of gold content. The remaining percentage, 8.33%, goes to other metals such as copper, zinc, nickel and silver. Because gold in natural form, 24K, is soft and pliable, any impurities added make it more strong and durable. Jewelries are predominantly made with 22K which is more durable and harder. But 22K is not often used for heavily studded jewelry or diamonds. 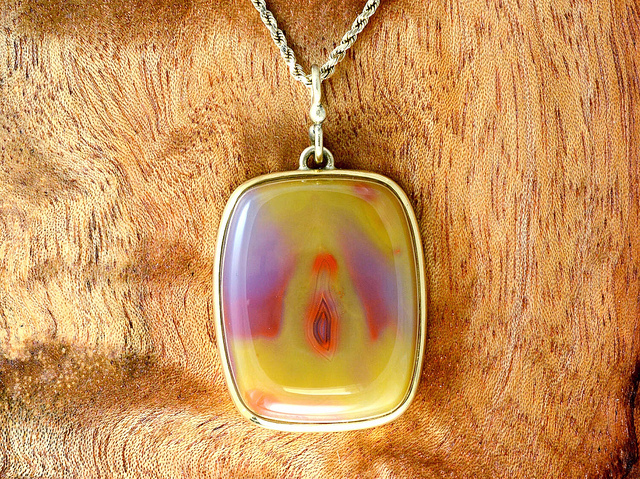 22K gold is subject to changes in color based on the abundance of secondary impurities included in it. There could be a pink gold, rose gold, white gold, green gold, etc. A white gold signifies the abundance of alloys such as palladium and nickel, while a green cold signifies the abundance of zinc or silver. If more copper is added, the gold could turn rose or pink or reddish. 24K remains bright yellow in color because there are not alloys in it. Other countries impose legal requirements on the sale of gold to be described as such. If, for example, a jewelry is printed 0.9166, it is a 22K gold expressed in fineness by dividing 22 by 24 and then multiplying with 1000. Others avoid this confusion by simply printing 22K, 18K or 14K to indicate the purity of the gold. The table below provides a guideline for gold buyers to avoid getting into trap of purchasing wrong products. 24K is the most pure gold in natural form containing about 99% of gold. Such gold is soft and pliable and can be molded into desirable shapes. On the other hand, 22K is the second most pure with 91.67% of gold and other alloys contributing the remaining percentage. These alloys could be nickel, zinc, silver or copper depending on desirable results. 24K is easy to discern with its bright yellow color. The 22K gold is, however, not easy to discern as the color depends on the alloys included. It could be pink, reddish, rose, green or white gold. It could, therefore, be difficult to spot the 22K gold if it has not been printed. 24K gold is more expensive than 22K gold simply because of its purity of 99% gold. Gold in its purest form is soft and pliable. The addition of alloys in 22K gold makes it more durable and harder. Therefore, 22K has more strength than the 24K hence it is used predominantly in ornaments and jewelries. 24K appreciates in value and it is used in many gold investments. 22K is seldom sold at its original cost after some years. 24K is used in lucrative investments because it retains its value for many years whereas 22K does not. Lusi Madisha. 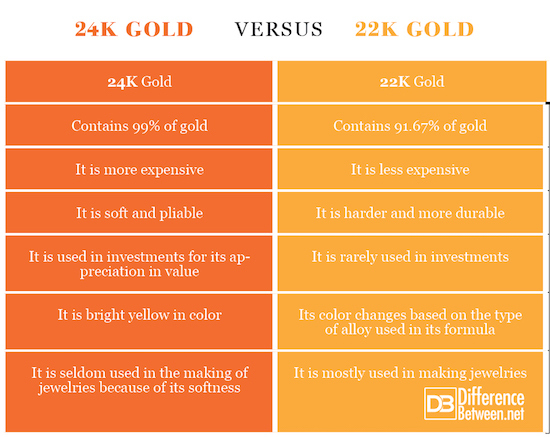 "Difference Between 22k Gold and 24k Gold." DifferenceBetween.net. July 23, 2018 < http://www.differencebetween.net/object/difference-between-22k-gold-and-24k-gold/ >.